SFP (shorts for Small Form-Factor Pluggable) is a compact, hot-pluggable transceiver used for both telecommunication and data communications applications. It interfaces to motherboard, router, switch or optical media converter. There are two types of SFP, single mode SFP and multimode SFP. And this articles will focus on Cisco SFP and make a comparison of Cisco single mode SFP and Cisco multimode SFP. What Is Cisco Single Mode SFP? 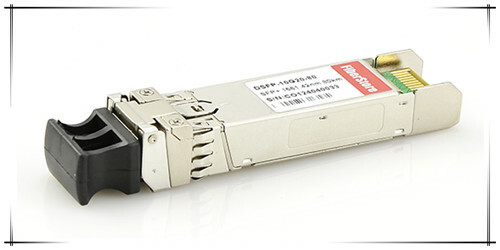 Cisco single mode SFP works over single mode fiber whose typical core diameter is 9µm. And the cladding diameter of a single mode fiber is 125µm. 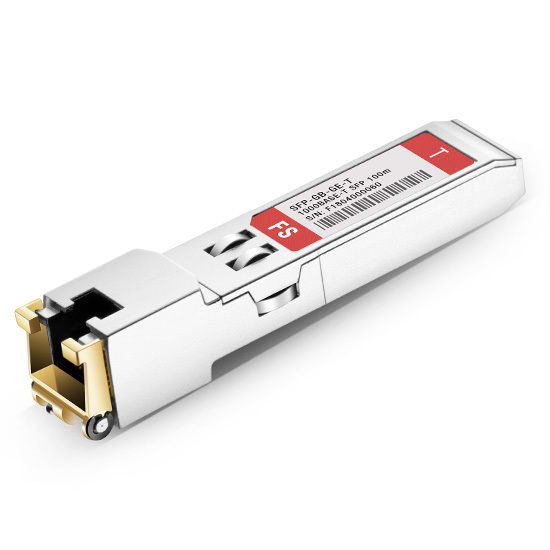 Cisco single mode SFP operates mainly at 1310nm and 1550nm wavelengths and is used in long-haul transmission environments of 2km, 10km, 40km, 60km, 80km, and 120km. Cisco single mode SFP consists of 1000BASE-EX SFP, 1000BASE-ZX SFP, 1000BASE-BX10-D SFP, 1000BASE-BX10-U SFP, and 1000BASE-LX/LH SFP. For detailed information, please check the chart below. What Is Cisco Multimode SFP? Cisco multimode SFP works over multimode fiber with the core diameter of 50 µm and 62.5 µm, and the cladding diameter is 125µm as well. The common multimode SFP operates at 850nm wavelength and is only used for short distance transmission of 100m and 500m. For detailed information, please check the chart below. Cisco single mode and multimode SFP modules can both server for transmitting and receiving optical signals and facilitate communication. However, the differences between them are also apparent. Here we will compare them from several aspects. Cisco single mode SFP will work with single mode fiber in order to perform both transmission and reception of data. Whereas Cisco multimode SFP will work with multimode fiber to provide higher speed at shorter distance. Cisco single mode SFP can support distance value as high as 80km or even 120km and mostly used in long distances (up to 10km) transmission environment. Whereas Cisco multimode SFP supports distance up to 550m, more used in a small area or within the building. Cisco single mode SFP works mainly on 1310nm and 1550nm wavelength, while Cisco multimode SFP works mainly on 850nm wavelength. 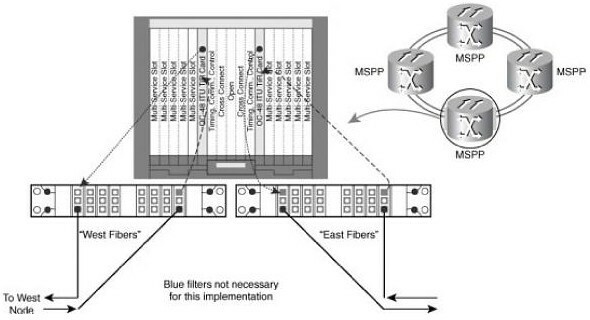 Cisco single mode SFP is mostly required on WAN connectivity. 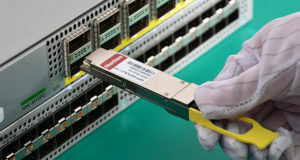 Whereas Cisco multimode SFP is used inside LAN for the switch, router and server connectivity inside building or data center. Generally speaking, Cisco single mode SFP is costly and Cisco multimode SFP is cheaper. That’s because Cisco single mode SFP requires a laser source for transmission and it typically uses a laser diode (LD) as the light source, which is expensive. While Cisco multimode SFP uses a light emitting diode (LED) as the light source. Now we learn a lot about Cisco single mode SFP and multimode SFP. Before you choose the SFP transceiver, you have to confirm the transmission distance and the wavelength you need and also the cables you already have. Remember that single mode and multimode are not interchangeable. So you have to take into account your actual situation and budget. To save more, you can choose a compatible transceiver module from FS.COM to match all your devices without sacrificing any quality or reliability but only at a lower cost. FS.COM offers various SFPs with a great offer that may be a good choice for you. Single Mode vs Multimode Fiber: What’s the Difference? This entry was posted in SFP Transceiver and tagged Cisco Multimode SFP, Cisco Single Mode SFP on November 30, 2018 by Admin. Many devices in the optical communication field are sharing similar functions, such as fiber SFP module and fiber media converter. They are designed as the equipment for photoelectric conversion. Some of you may get confused about the two seemingly similar devices. Don’t worry, in this article, we are going to reveal the secret between SFP fiber module and fiber media converter. In the beginning, let’s go over the definitions of them. The SFP (small form-factor pluggable) module, also called mini GBIC (gigabit interface converter), is a compact, hot-pluggable optical transceiver used for both telecommunication and data communication applications. It converts electrical signals to optical signals and vice versa. Usually, the SFP module consists of optical SFP and copper SFP. And the type depends on whether their SFP ports connect with fiber optic cables or copper cables. The fiber SFP module can support SONET, Gigabit Ethernet, Fiber Channel, and other communication standards. What Is Fiber Media Converter? 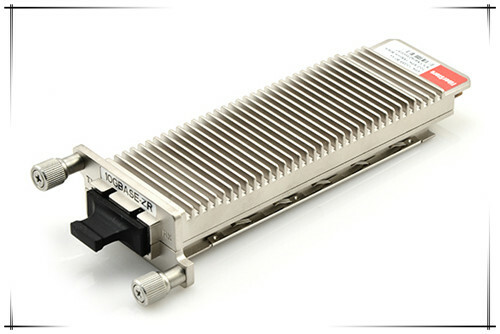 Similar to the working mode of optical transceivers, the fiber media converter receives data signals from one media and transmits them to another. Conventionally, fiber media converters can support two kinds of conversion: copper-to-fiber and fiber-to-fiber. Copper-to-fiber media converters are devices designed to connect two dissimilar media types, such as the twisted pair with fiber optic cabling. They will be chosen when the transmission distance of two network devices with copper ports need to be extended via fiber optic cabling. When it comes to the fiber-to-fiber conversion, it supports a connectivity not only between multimode fiber and single mode fiber but also a dual fiber link and single fiber using Bi-directional (BIDI) flow. Conversions between different wavelengths can also be achieved by some fiber-to-fiber media converters. 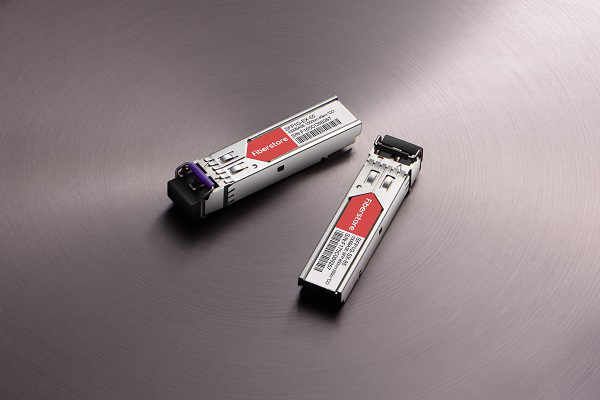 A fiber SFP module has a much smaller size than a fiber media converter. Before catching the connection between fiber SFP modules and fiber media converters, we had better know the media converter’s physical structure in advance. So far, copper-to-fiber media converters cover two types of ports. One is for copper (usually the RJ45 port) and the other is for fiber. As for fiber ports, two kinds can also be found. One is designed to insert fiber optic transceivers (SFP, XFP and etc), and the other to connect fiber optic patch cables (SC, LC and etc). 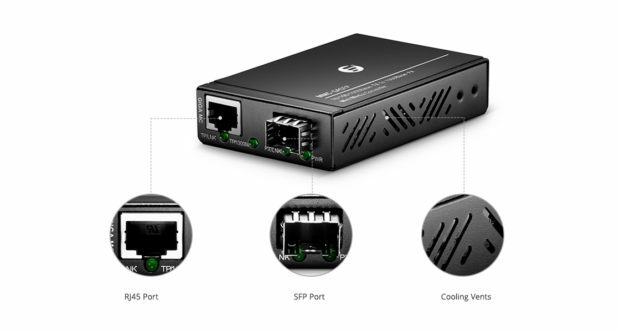 As for fiber-to-fiber media converters, both the input ports and output ports are for fiber link. It can be a fiber optic connector for fiber patch cables or an SFF connector for optical modules. After knowing the media converter’s physical structure, it will be easier for us to grasp how does it coordinate with the SFP fiber module. Therefore, if you want to make an SFP module and a media converter both into use at the same time, you need to choose a fiber media converter with fiber ports for an optical transceiver. That is to say, you can insert you SFP module into one side and connect an RJ45 copper cable with the copper port on the other. To sum up, in this article, we introduce what the fiber SFP module and the media converter are. Then after studying the media converter’s physical structure and how it coordinates with the fiber SFP module, we can understand the connection between the fiber SFP module and the media converter. This entry was posted in SFP Transceiver and tagged Fiber Media Converter, fiber sfp module, optical transceiver, SFP fiber on August 31, 2018 by Camilla.Zhang. According to the report of Gartner, Cisco has taken up almost half of the global network equipment market share (totally $38 billion), ahead of other competitors in the telecommunication industry. To a large extend, it is the switches’ market share that attributes to this success. Cisco SFP is the small form factor pluggable module that is usually plugged into the switch. But its price is very high, even up to thousands of dollars. The highly cost is the reason why many customers hesitate to buy it. So in this case, in order to offer a cost-effective solution for you, Cisco compatible SFP in Fiberstore comes around. Cisco compatible SFP offered by Fiberstore are the most cost-effective standards-based SFP modules fully compatible with Cisco switches & routers. The main advantage of Cisco compatible SFP over Cisco SFP is its cost, which makes it become the cost-effective solution. Here we are going to give a price comparison by taking some examples. With this great advantage, Fiberstore has become one of the best-sellers in this industry. What is more, besides the above kinds, various kinds of Cisco Compatible SFPs with good quality and service are also offered here. The capacity of Fiberstore Cisco compatible SFP modules is as good as Cisco SFP. They are both of low-power consumption, operating on Cisco switches steady. Generally, there are three kinds of Cisco compatible SFP modules designed to used for three main applications. They are Fast Ethernet SFP, Cisco Gigabit Ethernet SFP and WDM SFP. Next, each application will be given a brief description. Fast Ethernet SFP – Fast Ethernet SFP comes in six configurations which can be described as the Cisco 100BASE-X SFP. 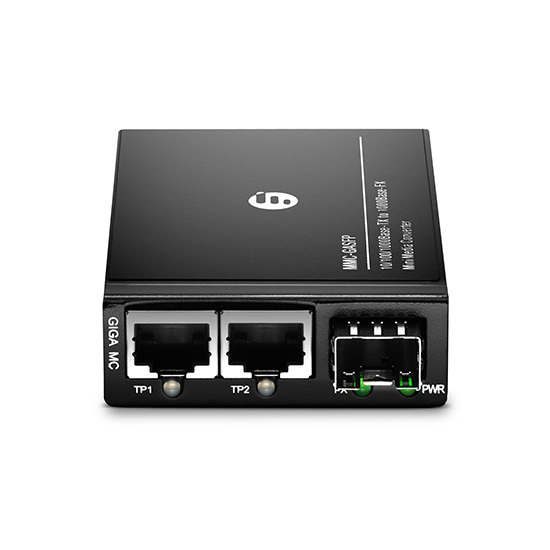 It is a hot-swappable input/output device that plugs into Fast Ethernet ports, dual-rate Fast/Gigabit Ethernet ports, or Gigabit Ethernet ports of a Cisco switch or router, linking the port with the fiber cabling network. One of its configuration is 100BASE-FX SFP, operating on ordinary multimode fiber optic (MMF) link spans up to 2 kilometers long. But there is a point you should note that Cisco offers two products for 100BASE-FX. One is GLC-FE-100FX is for 100Mbps Ethernet ports, and the other one is GLC-GE-100FX is for Gigabit Ethernet ports. Both products can be found in Fiberstore with compatible solution. Gigabit Ethernet SFP – SFP for Gigabit Ethernet can be described as Cisco 1000BASE-X SFP, which plugs into a Gigabit Ethernet port or slot. Compared with Fast Ethernet SFP, its speed and capacity are better. And currently, it still plays an important part in the telecommunication networks. For example, 1000BASE-SX SFP, which is a cost effective module with high performance, can support dual data-rate of 1.25 Gbps/1.0625 Gbps and 550m transmission distance with MMF. CWDM & DWDM SFP – The speed of CWDM & DWDM SFP can be up to 10 Gbps, with a full options of wavelength for both CWDM and DWDM applications. They both allow enterprises, companies and service providers to provide scalable and easy-to-deploy Gigabit Ethernet and Fibre Channel services in their networks. Nowadays, Fiberstore has become one of the leaders in compatible optical transceiver modules global manufacturer and supplier trade. At present, there are a lot of discounts for bulk orders in Fiberstore. For more information, please contact us directly over e-mail sales@fs.com. This entry was posted in SFP Transceiver and tagged 1000BASE-SX SFP, 100BASE-FX SFP, Cisco compatible SFP, Cisco SFP on September 1, 2015 by Admin. Traditionally, SONET platforms have been dedicated to services that could be encapsulated within SONET frames. Today vendors not only can deliver SONET services from MSPPs, but they also can hand off these services in a DWDM wavelength service. DWDM can be implemented with an MSPP in two ways. Most often when you think about DWDM systems. However, the multiplexing of multiple light source is always a “passive” activity. Wavelength conversion and amplification is always the “active” DWDM activity. MSPP chassis with integrated DWDM optics in which the optics cards (in this case, OC-48s) use one of the ITU wavelengths and interfaces to an external filter. This filter multiplexes the wavelengths from various optics cards within multiple chasses and transports them over the fiber, where they are demultiplexed on the MSPP because the filter is a separate device. This inefficient use of the rack and shelf space has led to the development of active DWDM from the MSPP. With active DWDM, the transponding of the ITU wavelength to a standard 1550-nm wavelength is performed by converting the MSPP shelf into various components required in a DWDM system. This conversion has greatly increased the density of wavelengths within a given footprint. For example the kind of passive DWDM, only 16 wavelengths could be configured within a bay, 4 per chassis. With today’s multiport, multiport optical cards, this density can be doubled to 8 wavelengths per shelf and 32 per rack. With the integrated active DWDM solution, one MSPP chassis can be converted into a 32-channel multiplexer/demultiplexer using reconfigurable optical add/drop multiplexer (ROADM) technology. Other chassis can be converted into a multiplexer (OADM), which can receive and distribute multiple wavelengths per shelf. The implication of this is that up to 32 wavelengths can be terminated within a bay or rack, a factor of eight times the density of even early MSPPs using a passive external filter. The traffic from within each wavelength dropped into an MSPP shelf from the ROADM hub shelf can be groomed or extracted from the wavelengths carrying it, as needed, and dropped out of the OADM shelves. ROADM is an option that can be deployed in place of fixed-wavelength OADMs. Cisco Systems ROADM technology, for example, consists of two modules: 32-channel reconfigurable multiplexer (two-slot module), 32-channel reconfigurable demultiplexer (one-slot module). Use of software-provisionable, small form-factor pluggable（SFP）client connectors, and wavelength tunability for reduced card inventory requirements. Multilever service monitoring: SONET/SDH, G.709 digital wrapper, and optical service channel for unparalleled service reliability. With so many advantages, one of the disadvantages is that parading shift is required to move the market toward MSPP-based DWDM. This slow migration is keeping vendors at bay in terms of development as they try to balance investment in the future with today’s revenue. The widespread introduction of this technology, however, DWDM price also should be considered. The price of DWDM transceivers is typically four to five times more expensive than that of their CWDM counterparts. 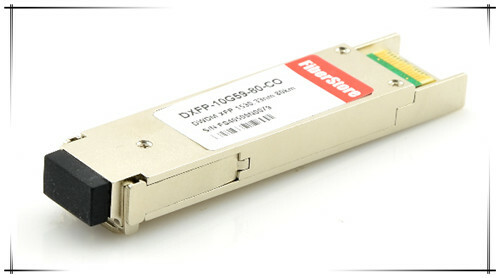 The higher DWDM transceiver costs are attributed to a number of factors related to the lasers. Several ways exist for protecting an MSPP-based DWDM system in the event of a fiber cut or signal degradation. Such protection options include client protection, Y-cable protection, and wavelength splitting. Reliability for these options varies, depending on the client network architectures and service-level agreements (SLA) provided to the client. Thus, there is no “one size fits all” approach to protection. This entry was posted in DWDM system, SFP Transceiver and tagged DWDM transceiver, DWDM wavelength, passive DWDM on May 14, 2015 by Admin. We all have a knowledge of fiber CWDM multiplexer. but how to choose suitable solution is what we need to know. As we know, because of its costs, DWDM is more suited to longer-reach applications if developers begin to value the real requirements are in the metro access/metro core space. DWDM is a useful solution for high-growth routes that have an immediate need for additional bandwidth. According to vendors, carrying that are building or expanding their long distances networks could find DWDM to be an economical way to incrementally increase capacity, rapidly provision needed expansion, and “future-proof” their infrastructure against unforeseen bandwidth demand. There has been a lot of hype in the recent past about metro 10gbase DWDM, Some supporters of DWDM claim that the acceptance of the technology will drive the expansion of the optical layer throughout the whole telecommunications network and allow service providers to exploit the bandwidth capacity that is inherent in optical fiber,But at present there are still a lot to be exploited. The widespread introduction of this technology, however, could at the same time will appear a lot of problems, it will lead to a long distances bandwidth glut and price disruptions, and set expectations for price points at the metro access/metro core that may or may not be achievable. Finally, one finds with some satisfaction the following quotes:”With so much unused fiber, when will metro nets really need WDM? What are the requirements for 40 Gbps systems? What are the new economic trade-offs between transparency and grooming. And which of the new service providers will succeed?”. Systems with DWDM technology have been used extensively in the long distances space and typically cos from 100 thousands to 1000 thousands dollars or more. There are economic advantages in using DWDM when the transmission costs are high, such as in long distances applications. Such use is justified by standard transmission -versus-multiplexing cost calculations. For example, to transmit 40 Gbps over 600 km using a traditional system would require 16 separate fiber pairs with regenerators placed every 35 km for a total of 272 regenerators. dense wavelength division multiplexing equipment, on the other hand, uses a single fiber pair and four amplifiers positioned every 120 km for a total of 600 km. At the same time, new Extended Wavelength Band (EWB) fiber is being introduced that allows a wider range of operation for the transmission system; some Coarse Wavelength Division Multiplexing equipment (which is more ideal for metropolitan environment) will make use of the E-band. Fiberstore designs, manufactures, and sells a broad portfolio of optical communication products, including passive optical network, or PON, subsystems, optical transceivers used in the enterprise, access, and metropolitan segments of the market, as well as other optical components, modules, and subsystems. In particular, Fiberstore products include DWDM related professional components. Welcome to visit our online store to know more about DWDM information anytime. This entry was posted in DWDM system, SFP Transceiver and tagged 10gbase DWDM, dense wavelength division multiplexing equipment, fiber CWDM multiplexer on March 13, 2015 by Admin. SFP (Small Form-Factor Pluggable Plus) fiber transceiver modules make the fiber optic network or fiber-Ethernet network easier to upgrade or maintain, users can replace a single SFP module during the process instead of replace the whole board with many modules on it. SFP transceiver are different types working with different wavelength for various kinds of distances. SX SFP use 850nm for max 550 meters, LX SFP use 1310nm for max 10km, ZX SFP could reach 80km. There is also copper SFP that use a RJ45 interface. DOM function for SFP is optional, it help users detect real time SFP working status SFP transceiver is an innovative, next-generation transceiver module. Cisco SFP Modules is also hot plugable, it is an upgraded version fiber optic transceiver, it represents the trend to be smaller and more flexibility. Cisco Compatible SFP includes a wide range of the transceivers with different working wavelength and distance. In the following list I will introduce you some information about GLC SX MM Transceiver and GLC LH SM Transceiver. Cisco GLC-SX-MM is 1000Base-SX SFP fiber optic transceiver for multimode fiber and it works at 850nm wavelength. GLC SX MM SFP is hot swappable module that fit for Gigabit Ethernet port or slot and link the port with the network, whose interface is dual LC for optical. GLC SX MM is about 1.3 cm x 5.7 cm x 0.9 cm in dimension, and 75g in weight. The GLC SX MM transceivers are compatible with SFP Multi-Source Agreement (MSA), 1000Base SX standard for Gigabit Ethernet and SFF-8472. The GLC SX MM transceiver consists of three sections: a VCSEL laser transmitter, a PIN photodiode integrated with a trans-impedance preamplifier (TIA) and MCU control unit. All modules satisfy class I laser safety requirements. The GLC SX MM SFP transceivers are high performance, cost effective modules supporting data-rate of 1.25Gbps and 550m transmission distance with MMF. Cisco GLC-lH-SM SFP fiber optic transceiver working at 1300nm wavelength, GLC LH SM is suit for both multimode optical fiber and single mode optical fiber, it is small size transceiver with LC interface and it is hot swappable, easy to use, no need further configuration. GLC LH SM is used in Gigabit network and its max working distance is 10km over SMF or 550meters over MMF, data transfer rate at 1Gbps and it works based on IEEE 802.3z standards. The GLC LH SM transceiver consists of three sections: a FP laser transmitter, a PIN photodiode integrated with a trans-impedance preamplifier (TIA) and MCU control unit. All modules satisfy class I laser safety requirements. 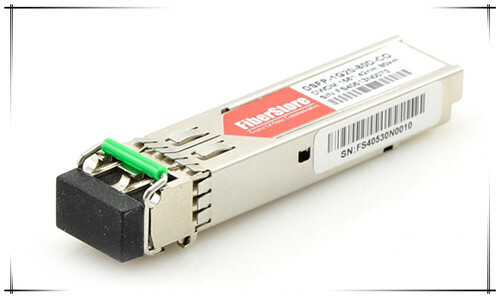 SFP fiber optic transceivers are upgraded version of its former GBIC transceivers, Cisco SFP transceiver adopt LC interface and its size is only about half of GBIC, thus Cisco SFP fiber transceivers fit for dense installations. This entry was posted in SFP Transceiver and tagged Cisco GLC-lH-SM SFP, Cisco GLC-SX-MM, SFP Transceiver on August 1, 2014 by Admin.